Up until now, Meter Chan’s enjoyed a pretty solid track record in the restaurant business. He co-founded Butao King in 2010 during the early days of the Hakata ramen craze, and after parting ways with the noodle bar-turned-chain, became a pioneer of the tsukemen trend, opening Kakurega Ramen Factory in Sham Shui Po. These restaurants succeeded because they focused on one thing and did it well. It’s a proven formula that Chan adopts once again for his latest venture, Munakata Beef House, which is dedicated to Japanese beef rice. Nestled on a quiet stretch of Tai Kok Tsui, the intimate restaurant only accepts walk-ins and seats a mere handful of customers at a time. Ample effort has been made to give the space an authentic Japanese feel, from the minimalistic décor to the custom-built, plain-wood counter that wraps around the kitchen like a sushi bar. 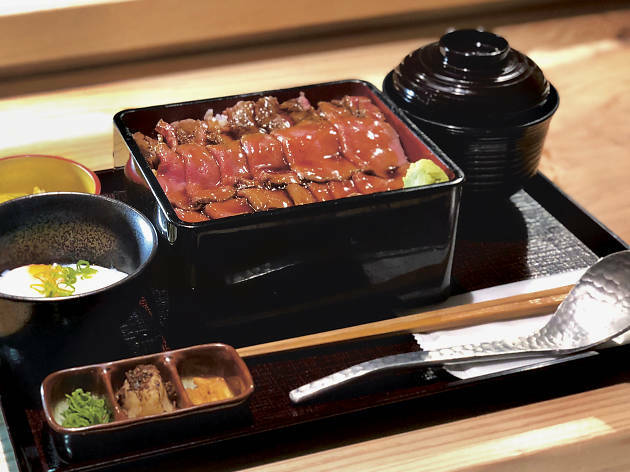 As for the beef rice, it’s served in a smart lacquered box (known as ‘jubako’ in Japanese) instead of a round bowl à la the more typical gyudon preparation. 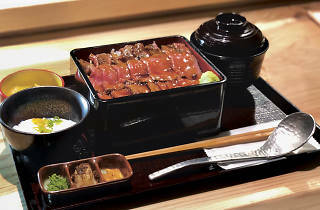 The main draw is the meat, of course, which is sourced from Munakata in Japan’s southerly Fukuoka Prefecture. You can order the round steak from the outer thigh ($168), the sirloin ($368) or a combination of the two ($268). Whichever cut you go for, it’s all served in 160g portions over rice with miso soup, Japanese pickles and a touch of wasabi on the side. We try the lean thigh cut, which is slow-cooked until tender then sliced into thin, 2mm pieces. It’s wonderfully robust and pairs especially well with fried chips of garlic. Meanwhile, the sirloin – which we’re informed is dry-aged in-house for two weeks – boasts a balanced marbling that’s accentuated when grilled to a pink-centred, medium-rare. It’s a shame then, that the meat is riddled with gristle. What’s even more shocking though, is when we realise that the beef isn’t cooked to order but is, instead, pre-grilled and then reheated prior to serving. Sure, customers get their meal quicker this way, but it’s also a blatant way of cutting corners and a waste of such a high-quality ingredient. The restaurant also offers New Zealand round steak ($98) and American Angus sirloin ($208). There’s a distinct meatiness to both, although they’re not nearly as supple as their pricier Japanese counterparts. And while the meat is passable, overall, the same can’t be said for the elements that accompany it. One of the core elements of a good beef rice bowl, the sauce at Munakata Beef House is uninspired and lacking in depth. The rice, likewise, fails miserably – overcooked to a mush that tastes even worse with the insipid sauce. And finally, there’s the onsen egg ($20). Instead of a beautifully runny centre, we get a half-cooked core that’s already set – unacceptable from any self-respecting Japanese restaurant. Munakata Beef House has the look and the concept of a winning Japanese eatery but the food fails to live up to expecations. After all, if you’re a beef specialist that can’t keep the gristle out of your meat, and you’re a Japanese restaurant that can’t cook an onsen egg right, then you really have your work cut out for you.